This ones for the boys! These board shorts by Lost are awesome! I love the checkered flag combo and the hint of pink. I think we all know some of the other brands I'd recommend for cool board shorts like Fox, Hurley, Billabong and Lip Ripper Fishing Gear. However, we girls like trendy and funny too so, you may want to look in to getting chubbies! They are in style right now and definitely make me laugh. (Chubbies are extra short but stylish and comfortable.) Maybe I can be a swimwear stylist for all...I have been asked to make swimwear for men and you can be sure to trust my opinion when it comes to board shorts. If you want to get the board shorts I recommend in this photo or shop for more, click on the link below. 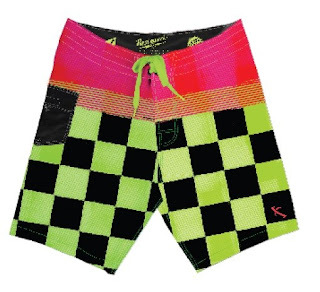 The Surfshop has many types of board shorts, with an assortment of patterns and lengths. Hi Paige, the click here link does not work. Nice shorts though!